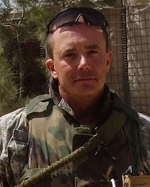 Robert Paul died September 8 of this year when a suicide car-bomber struck his Humvee in Kabul, Afghanistan. Sgt. Paul was in his third year of active duty in the Army reserves and had completed two years in Iraq commanding a civil affairs unit in Baghdad. Paul had also served in Peace Corps in Kenya and last year, while studying Thai at the Defense Language Institute in Monterey, joined a 2005 e-mail debate peacecorpsonline.com (sic) about Peace Corps as an incentive for military recruitment. Read more. One year ago, Staff Sgt. Robert J. Paul (RPCV Kenya) carried on an ongoing dialog on "Peace Corps Online" on the military and the peace corps and his role as a member of a Civil Affairs Team in Iraq and Afghanistan. We have received a report that Sargeant Paul has been killed by a car bomb in Kabul. Words cannot express our feeling of loss for this tremendous injury to the entire RPCV community. Most of us didn't know him personally but we knew him from his words. Our thoughts go out to his family and friends. He was one of ours and he served with honor. Read the original discussion with Bob Paul on "Peace Corps Online" here. Paul's mother said her son never stopped charting his own path, whether it was taking German when French and Spanish were the only languages offered, or announcing over dinner that he had joined the Peace Corps. "His first year there, he learned Swahili, and that's a very hard language, I understand," she said. "Then when that year was up, he called and said he was staying another year." When he left for Afghanistan "I asked, 'Is there anybody I can call to get you out,'" his mother recalled tearfully. "He said, 'You don't understand; I want to go.' Kenya RPCV Robert Paul worked in a Civil Affairs unit in Afghanistan. He was killed in a car bombing in 2006. Read more.